Adrift is the latest sci-fi novel from Rob Boffard, also known for his rather good ‘Outer Earth’ series. The premise is an intriguing on. Following an attack by an unknown force, a small personnel shuttle is cast loose with a group of passengers inside. Damaged and alone, the passengers have no obvious way home, no way to signal for help, and only each other to rely on. That tension, the sense of being in a fragile bubble when the environment is actively hostile, is masterfully evoked. Survival has always been an interesting genre in narrative - from The Thing to Cast Away, as humanity struggles against their world and themselves. Adrift takes that basic concept and dials it up to eleven. Space is big. Really big. Space is also cold, uncaring, and willing to punish the slightest lapse in judgment with fatal consequences. This is a book which wants the reader to know that space is dangerous, a stark, lonely, beautiful and deadly place. Alongside the environment, there are more active threats. The shuttle is the main setting of Adrift, a broken-down tourist hauler. Old, battered, poorly supplied, this is not where anyone would want to spend their last hours. It flies, sure, but there are deft touches in the story to let us know that this isn’t a luxury craft – rations are short, safety equipment neglected, and food supplies worryingly uniform. It’s described with the sort of nuanced and evocative prose that left me with a firm picture of a ship which has seen better days, plugging along despite institutionalised neglect. As the majority of the story happens here, the grit, the grime and the stark realism of the environment really help sell the text – and as this unstable raft is floating in a vacuum sea, its deficiencies bring tension to bear even further. Each misplaced can of soda or leaking hydraulic line is one inch closer to disaster, and one more opportunity for every-day heroism. There’s more to the world – the edges of a post-war, higher-level political settlement are there to be examined; this is a universe which has known conflict, victories and defeats – but the heart of the story is this one ship, floating alone in the void, and the people inside it. Speaking of the characters, they’re a motley ensemble. There’s a pensioned-off mining engineer, and a tour guide working her first job. Holidaymakers, broken-down journalists, and a pragmatic but distant pilot. There’s a mixture there of old and young, a melange of humanity. They don’t seem like a group that is going to save the world. Honestly, they don’t really feel like a group which can be trusted to go to the cinema together without coming to blows. But they do feel like people, staggering under the weight of extraordinary events, thrown into a high pressure situation not of their making, then left to sink or swim. The inter-personal dynamics are delightful. The rage, the pettiness, the moments of startling compassion and of self-justification. The whole gamut of human experience is being sweated out in the closed environment of a tourist-shuttle. It's this pressure cooker environment which kept me turning the pages. Knowing that this group of strangers would have to pull together to survive, seeing their internecine squabbles and bickering was painful, but wonderfully human. Similarly, the moments when one was able to rise above themselves, to act for the whole, to do the right thing, even if they weren’t sure what that was – well, that felt human too. The characters are each unique, with flaws and secrets from themselves and each other, and if some react well or badly, if they leap into action, or consensus, or despair, then it felt right, for them. And in the background of this maelstrom of emotion, the air supply is ticking down, and the outside is patiently waiting. This is a story about people, about how they interact – how they bounce off each other, how other people’s actions shape us, and how our actions shape the world. It’s about surviving in high pressure situations, how that changes you, and how you remain the same. It’s a story about people, and those people are living, breathing, lovingly crafted and awfully flawed – which makes them a pleasure to read about. Overall, this is a taut survival thriller and a top-notch character piece. If you enjoyed Boffard’s other work, this one’s worth a look. 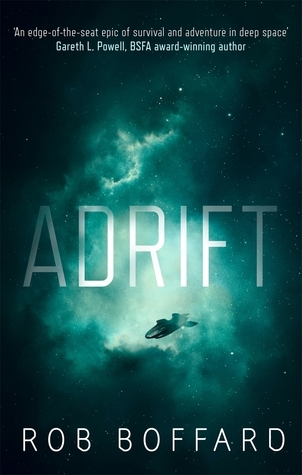 If you’re new to him, then Adrift would be a great place to start.